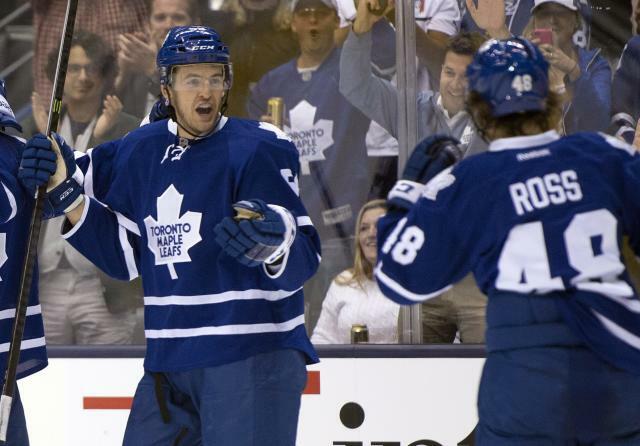 What's up with the Toronto Maple Leafs and performance enhancing drugs? Earlier in the year, it was Carter Ashton who got the hammer. Now it's minor league forward Brad Ross. “The Toronto Maple Leafs organization supports the AHL Substance Abuse Program and today’s decision to suspend forward Brad Ross. “Our organization is diligent in its work to only provide our athletes supplements approved by the Banned Substance Control Group, and we’ve stressed the importance of staying within these parameters to maintain the integrity of what goes into their bodies. We are disappointed with Brad and fully support today’s suspension." Ross will not be eligible to play again until March 8 according to the Toronto Sun who summarized how um ... performance enhancing drugs have 'ravaged' the Maple Leafs so far this season. The 6-foot-1, 185 pound Lethbridge, Alta., native considered himself a Darcy Tucker-type agitator, who had 203 penalty minutes in his draft year with the WHL’s Portland Winterhawks. But he has yet to earn a full time role on the farm because of injuries and job competition, splitting his first two seasons with the Marlies and ECHL teams and playing mostly a third and fourth-line role this year through 21 games. Earlier this season, winger Carter Ashton tested positive for Clenbuterol, which he said he ingested unknowingly through an inhaler that a summer training partner gave him to deal with an asthma attack. Ashton served 20 games under terms of the NHL drug policy and was eventually waived by the Leafs back to the Marlies. It cost Ashton almost $170,000 US in salary. Again, what's up with the Maple Leafs on this one? Haven't they seen the South Park where Mr. Mackey said, "drugs are bad, umm, OK."
It's tough to believe Toronto is spoon-feeding its players PEDs. And even if it is, it's clearly not helping a ton.